The 65-year tradition of the Robin Hood Festival continues, enjoyed by residents and newcomers. As the mild sun rose on Old Town Sherwood the morning of Saturday, July 21, the streets quickly filled with lawn chairs, blankets and towels; bikes, strollers and scooters; and iced coffees, doughnut boxes and plastic water bottles sold on the lawns of enterprising homeowners for $1 each. The objective was simple: secure a spot for viewing the Community Parade, one of the marquee events of the 65th annual Robin Hood Festival. "My favorite memory is always the parade," said Sarah Jensen, as she and her two daughters and two dogs found a shady spot near Sherwood Middle School. "And as the kids have grown up, I've gotten to watch them enjoy the parade." "It's a good way to get our community together," said Sarah's daughter Taylor. "It's fun to watch, and you can go with your friends," added her sister Trista. 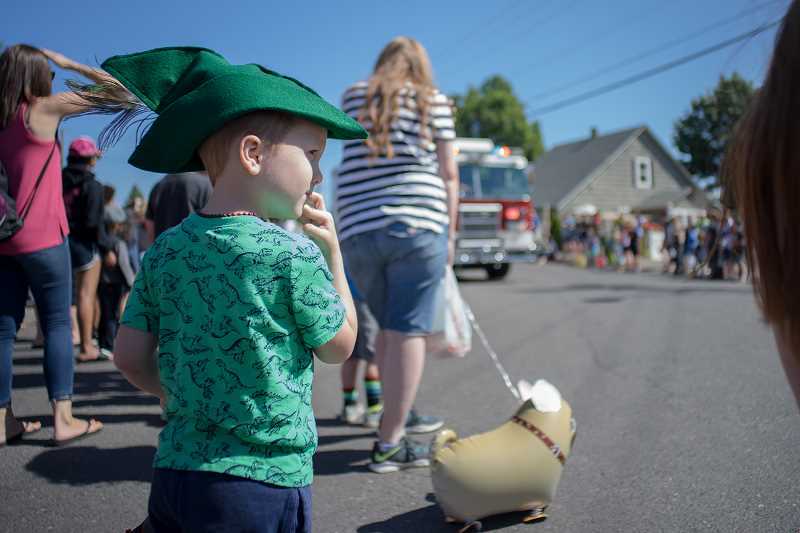 The Jensens, Sherwood residents, have been attending the Robin Hood Festival for about 10 years — but the festival attracts plenty out outsiders and first-timers as well. Dave Mettler made the two-and-a-half-hour drive from Waldport after catching a local TV news segment about the festival. "They were showing the dancers and explaining the history of the festival," he said. "I thought, man, I lived in Portland and never knew this went on. It was like, well, let's go check it out." "Just enjoy the day and people watch, and wear funny hats for the day," Amy said. Incoming high school senior Dylan Blue has lived in Sherwood for seven years, but his family had always been out of town the weekend of the festival. He finally got a chance to watch the parade and support his cheerleader girlfriend, before heading to work for the day. "I have a lot of friends that have come in the past," Blue said. "It's always sounded really fun." Just a few feet down the sidewalk from Blue, Tigard resident John Oki entertained his four young children while waiting for the parade to kick off. Oki's brother-in-law is a parade participant, and he had his camera ready to capture his kids' faces when all the floats came down the street. His daughter Daphne, 7, had a succinct answer when asked what her favorite part of the Festival was: "The candy, and the floats." Her brother Duncan, 9 (though "10 in less than a week! "), gave a similar answer. "We went last year and saw the vendors, and I think he likes the swords, too," John added. "Oh yeah, that was pretty cool, too," Duncan said. The festival had kicked off the evening before with a knighting ceremony, live music and a beer garden. The weekend also included plays at the Center for the Arts, a community garage sale, the Maid Marian Court, a castle-building contest, performances by the Sherwood Renaissance Singers and the Seattle Knights, and an archery tournament against the town of Nottingham, England. All of these traditions have been built over 65 years, and new ones are added every year. Lillian Perez recently moved to Sherwood and watched the parade to support her boyfriend, who helped coordinate the band. Her friend Blake Kuroiwa, a Beaverton resident, sat next to her on the sidewalk. "We have a lot of friends who went to Sherwood," Kuroiwa said. "They always come back for the Robin Hood Festival."